The modified Audi SQ5 is equipped with Delphi-designed radar and anti-collision software. In 1903, a 31-year-old physician named Horatio Nelson Jackson journeyed from San Francisco to New York in a Winton touring car, the first motor car to traverse the U.S.
Now, Delphi Automotive is trying for its own "first" -- a 3,500-mile journey from San Francisco to New York that the company bills as the longest single trip in an autonomous car. 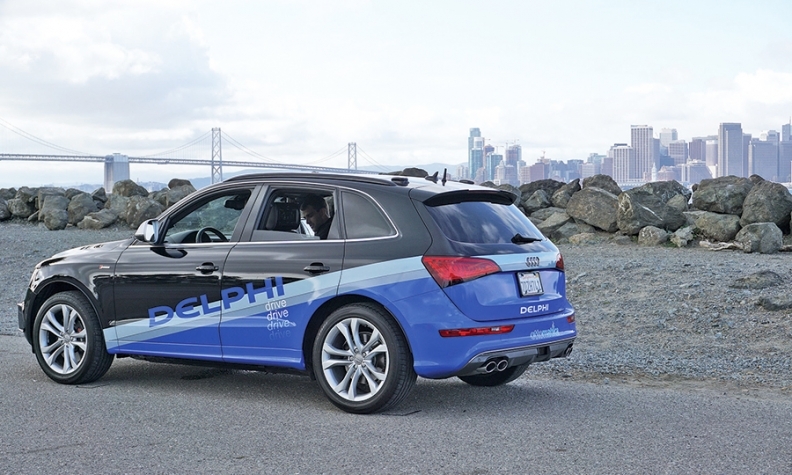 On March 22, a Delphi team of six engineers set out from San Francisco in a modified Audi SQ5 equipped with Delphi-designed radar, cameras, lidar and anti-collision software. The parts supplier is showcasing technology that can be used for traffic jam assist, valet parking and highway cruise control with lane-change capability. To be sure, other suppliers have rolled out their own driverless prototypes. In 2012, for example, Continental piloted a driverless VW Passat from Nevada to Michigan. Nevertheless, Delphi's trip deserves attention. During the International CES in January, Delphi let journalists ride shotgun while its car navigated the traffic-clogged streets of Las Vegas. With its motley assortment of taxis, shuttles, motorcycles, buses and ambulances, the Strip offered a stiff test for a driverless car. In any event, Delphi is likely to have an easier time crossing the country than Jackson did. After numberless breakdowns, blown tires and wrong turns, Jackson completed his trip with a mechanic and his trusty dog, Bud, in 63 days. Delphi's car is expected to arrive in time for Delphi's annual investors conference in New York this week.